By Car: Take BC Ferries from Horseshoe Bay, then follow Highway 101 north to Sechelt. Less than two hours total from downtown Vancouver. By Plane: Charter or land your own plane at Sechelt Airstrip. Fly! Coastal Airlines provides air taxi service to and from the Sechelt airstrip. By Float Plane: Harbour Air, West Coast Air and Tofino Air fly from Vancouver Airport, Downtown Vancouver, Victoria, Nanaimo and Tofino. By Helicopter: Airspan and Blackcomb Helicopters provide helicopter charter service to and from the Sunshine Coast. Sechelt, British Columbia is north of the BC Ferry Terminal in Langdale which arrives from the Vancouver mainland. 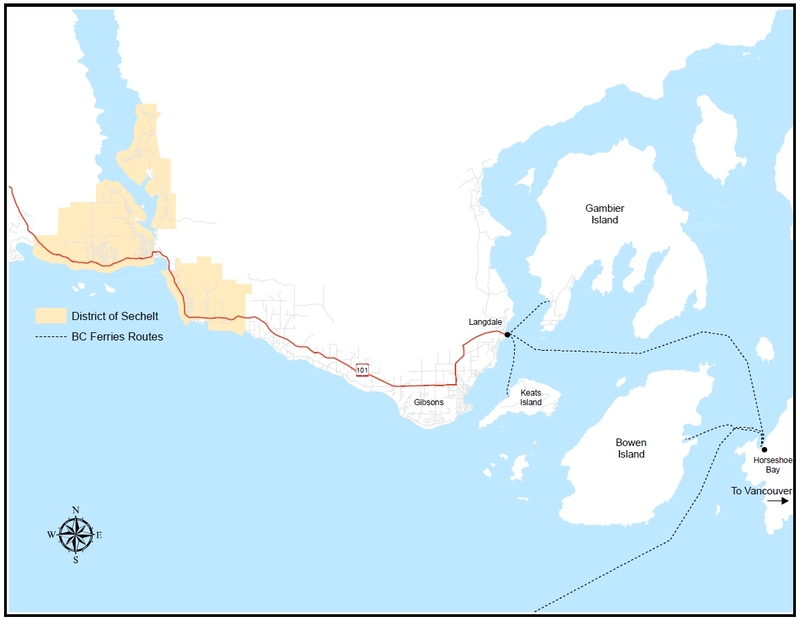 Sechelt is located south of the Earls Cove BC Ferry Terminal where the BC Ferry acts as the connector for Hwy 101 between the upper and lower portions of the Sunshine Coast. From the City of Vancouver, BC: To reach the Sunshine Coast, take the Langdale Ferry at Horseshoe Bay. Horseshoe Bay is located just 20 minutes north of the city of Vancouver, off Highway 1. The Langdale Ferry runs approximately every 2 hours and the ferry crossing time is 40 minutes. Boarding the ferry in Horseshoe Bay, your journey to the Sunshine Coast really begins. For forty minutes you will be enchanted by the scenery of fir and cedar treed islands against a backdrop of coastal mountains. After docking it is a twenty-six kilometre drive (driving time approximately 30 minutes) on Highway 101 to downtown Sechelt. Time is based on the amount of stops taken as the scenery will slow progress down. From Comox Valley on Vancouver Island: Approaching Sechelt from the northern side of the Sunshine Coast can be best accessed from the Comox Valley on Vancouver Island. Here there is the Little River BC Ferry Terminal which takes you directly to the community of Powell River and then continue for a short 35+ km drive south to Saltery Bay BC Ferry Terminal. At Saltery Bay take another BC Ferry ride to Earl's Cove. From the terminal continue south on Hwy 101 to Pender Harbour then onto Halfmoon Bay. About 15 km south from the turn off to Halfmoon Bay, you'll arrive in Sechelt. West Coast Air: For those of you flying into Vancouver International Airport, you can rent a car at the airport and drive to Horseshoe Bay Ferry Terminal. Or, another option is to take a float plane from Vancouver Airport directly to the Sunshine Coast. West Coast Air offers daily flights from Vancouver Airport (Richmond) to Sechelt on the Sunshine Coast.